🏛 Why it Matters for Government: Chinese e-commerce giant, Alibaba, is expanding an artificial intelligence software pilot from Hangzhou, China to Kuala Lumpur, Malaysia. Alibaba calls the project City Brain — and its goal is to leverage Alibaba’s robust cloud infrastructure to connect disparate data sets to be a basis of informed (and sometimes automated) decisions. For government agencies, expect to see more cloud vendors like Google, Amazon, and IBM begin to optimize and package their capabilities for government-specific use-cases. One thing to keep in mind is that the rise of third-party capabilities will also create some challenges (or perceived conflicts) with data privacy, utilization, and ownership that agencies will need to deal with upfront by having transparent and easy-to-understand data policies. What privacy? — 25% of American’s are willing to share sensitive information (driving records, financial, etc.) in exchange for benefits (i.e., lower cost, personalization, etc.). Voice becomes more normal — Amazon Alexa’s install base went up 10 million in one year, meaning roughly 30 million homes have an Alexa — and now there are also over 30,000 unique skillsets that can be used through an Alexa. The technology market is booming — Private and public investments in U.S. technology companies is at a 20-year high. Changing definition of work — The number of freelancers grew 8.1% since 2014 and the total workforce only grew 2.5% — showing a clear shift in direction. For government agencies, this is a helpful read to keep up with the bigger picture of the technology and behavior trends reshaping society. You can download the full 294-page report here. For government agencies, it’s important to remember that the work you do is grounded not just in your agency’s inherent purpose but in the vision and direction of your leadership. Understanding the bigger picture issues through the lens of city leadership is critical for employees and also for gov tech companies looking to help agencies navigate and solve these challenges going forward. Check out this year’s State of the City report and compare to previous year’s results. GovTech compiled a similar analysis related to tech priorities at the state level based on governor speeches. 🏛 Why it Matters for Government: This was a great read from William Eggers and his co-author regarding how to connect data to residents with storytelling. Often times many agencies will put information online in its raw form — but for most citizens, there is little context to understand or work with the data. This is a challenge many open data portals face because the presented data is not consumable by constituents or government. So how do we solve this problem ? By telling stories with data. For government agencies, here are four tips outlined in the article for doing just that. Show, Don’t Just Tell — Use visuals to paint a story that can be understood by everyone. Pick a High Impact Problem — Focus on uses data to raise awareness of things people care about. For example: Knowing the location of all the fire hydrants in the city isn’t one of them (unless you’re a firefighter). Share How Data Drives Decision Making — Provide a feedback loop that uses data to inform the public why decisions are made. Make Storytelling a Two-Way Street — Don’t just publish data stories, provide a vehicle for the public to engage (participate) with data without being a data expert. 🏛 Why it Matters for Government: This read reiterated some of the changes to car-ownership. Even in the Mary Meeker Internet Trends report from above (Page 130), it’s evident that in certain markets people are forgoing traditional car ownership for ridesharing, carpooling, or car subscriptions. For government agencies, this is an important trend to continue to follow as car subscriptions change the revenue model for government significantly (i.e., missing out on the large upfront sales tax payment at the time of sale, less public parking revenues, etc.). These trends also lay the perfect foundation for the rise of autonomous vehicles which will lower the price of transit significantly. 🏛 Why it Matters for Government: Cube Satellites, or CubeSats, are disrupting the traditional space industrial complex and the startup Planet Labs is leading the pack with a low-cost satellite imagery system. Space imagery was always incredibly expensive because it required hundreds of millions of dollars worth of space infrastructure to facilitate, but with the democratization of launching satellites into low-earth orbit and the decreasing cost of core-infrastructure (CubeSats cost only a few thousand dollars), a new space race is beginning. For government agencies, this means that you might license better imagery from a startup with a CubeSat then the traditional proprietary incumbents. The disruption doesn’t stop with imagery as companies like SpaceX are working on enabling a global Internet using the same approach the Planet Labs used for imagery. 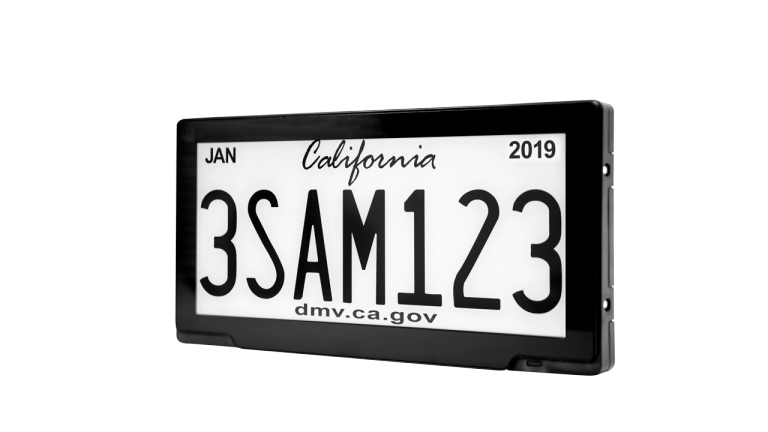 🏛 Why it Matters for Government: The State of California has been working to launch digital license plates for some time, but recently Sacramento announced it would be the first city in the state to run a pilot of digital license plates — enabling users to register vehicles that receive digital renewal stickers automatically. The upfront cost will be $699 with a monthly fee of $7. The city is working with Riviver Auto on the pilot and will be testing on city vehicles to start. It’s important to note that not everyone is a fan of the new pilot as some have raised privacy concerns as well as challenges to the use of ads when vehicles are stopped. For government agencies, it’s important to remember that the vehicle is increasingly becoming where smart cities and people meet — so it’s natural to see pilots on all forms of transportation tech, including the license plate. I’ll be following this pilot to see how the city (and state) ultimately balance privacy with user convenience. 🏛 Why it Matters for Government: This was an interesting read how NYPD officers will now hand out business cards to make it easier for the public to request body camera footage after ‘Stop-and-Frisk’ interactions with police that don’t lead to an arrest. The cards contain the name of the officer, along with their rank and shield number. If you want to obtain the officer’s body camera footage of the stop, the card directs you to an NYPD website which walks you through how to file a request for the footage under the state’s Freedom of Information Law. (CNN). There are opposing viewpoints of this new law and procedures effectiveness — including some that think it will lead to every police interaction being challenged. Whether or not that happens remains to be seen. For government agencies, this is an example of some of the new types of regulations that will have to be applied to smart city technology bringing transparency to public data (even offline interactions) in new ways. 🏛 Why it Matters for Government: Human-centered design is something that private companies have used to design habit-forming products for some time, but it’s finding a new home in the public sector. For government agencies, it’s natural to try to design solutions to problems — but we need to take a few additional steps back to look at and understand who our customer is. By understanding your customer and the gaps in how they access your services, you can better define and solve problems based on your end-users experience. For agencies interested in learning more about how to deploy human-centered design, I created a Government Experience Model and Framework that can be used as inspiration to start. 🏛 Why it Matters for Government: One of the growing concerns of the increased utilization of Artificial Intelligence in government is the rise of algorithmic bias — and ultimately, how government combats it. Essentially, that means that the human bias we exhibit also becomes embedded into new systems through our algorithms because it was accidentally programmed or learned from previous bias through machine learning. This becomes even more important as AI is being tested in a variety of new use-cases such as recommending bail amounts for defendants. For government agencies, if you’re using AI inside your agency make sure you have a system and process to check and respond to algorithmic bias. If you missed last week’s list, you can still read about your current car is smarter than you think, blockchains that can talk to one another, and why AI isn’t the death of jobs.